If you are analyzing a Market Page, i.e. a page that is part of a Facebook Global Page, you might have some questions about how it all works within quintly. What is a Global Page on Facebook? Before we move on with how we handle Facebook Pages being part of a Global Page within our tool, it is important to understand the concept of the Global Page construct in general. Facebook published a great summary which you can find here. In short: A Global Page is simply a layer on top of a bunch of technically independent Facebook Pages with a unified fan count and separate URLs. Imagine you call that URL of a concrete Global Page, what Facebook does is to simply check which of the underlying regional Facebook Pages belonging to that Global Page is the best match for you by looking at your language and/or country settings. As a result you will be redirected to that Page. These subpages on the other side can be managed separately as this is the case with any other Facebook Page that is not part of a Global Page. Directly on Facebook, you can check if a page is a Market Page. 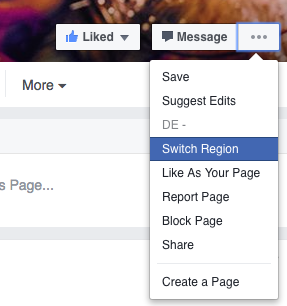 Just click the "..." on any Facebook Page and search for the "Switch Region" option. If present, you can be sure the Facebook Page you are looking at is part of a Global Page. Also, following that option you can easily switch to any other country and/or language Market Page and thus overwrite the default assignment Facebook has done based on your personal language and/or country settings. If you do this, you will see how the URL will change. There are other indicators, e.g. when looking next to the profile picture. Usually it shows which Page you have been redirected to. This as well is a clear indicator this Page belongs to a Global Page. You can also identify Market Pages when adding a page to the tool. Not only do you see the globe icon next to the page name indicating it is part of a global page, but an explanation about Market Pages will show underneath as well. This is probably the most asked question by our clients. As we know now, technically a Global Page is just a layer on top of a bunch of independent Facebook Pages providing redirect logic and a global fan count on top. Let's take Coca-Cola as an example. If you follow the URL of their Global Page (https://www.facebook.com/cocacola), you'll notice you will be redirected to the best matching Facebook Page being part of that Global Page. And you quickly notice that every single Market Page within that Global Page also has a unique URL. E.g. 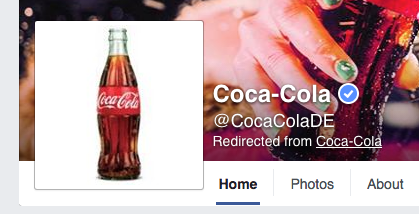 in case of a German user you will be redirected to https://www.facebook.com/CocaColaDE/?brand_redir=40796308305. Within our tool, every single country and/or language Market Page will be managed as a separate profile. This makes sense as technically these are completely separate Facebook Pages, having their own posts, their own user management etc. Thus to add a Market Page within our tool, simply copy & paste the concrete URL, e.g.https://www.facebook.com/CocaColaDE/ for the German Market Page of Coca Cola, into the search field within our New Profile dialog. This will directly show the correct page and you just need to select and add it. This way you can add any country and/or language Market Page to our tool. It's also good to note that this approach will work for any Facebook Page, even for those that are not part of the Global Page construct. So whenever you copy & paste the concrete URL of a Facebook Page and you made sure you are on the right Market Page on Facebook, our tool will automatically find the page you are looking for as each URL of a Facebook Page is unique - even if the page is part of a Global Page. Once you add multiple country and/or language Market Pages of the same Global Page, you'll quickly notice that on Facebook most of them have the exact same name. However, it is possible to label profiles to make it easier to identify what country and/or language a Market Page belongs to. A great feature to help here is our Appendix customization. Simply click on a page you have already added. Under the Customize Profile section, you can add an appendix. The appendix will then be shown after the page name throughout the whole tool. Additionally, you can set a custom color which will then be used within all charts of our tool for that specific page, and even choose to highlight this page in line graphs. Why does the fan count of the Market Page not match the global fan count for pages that are connected to Facebook Insights? For any public page that you track we'll show the global fan count. However, for any page that is part of a Global Page and is connected to Facebook Insights in quintly, you'll be able to see the local fan count for your Market Page. Thus this number will always be lower than the actual global fan count you'll see on Facebook directly, as Facebook shows the sum of fans from all the Market Pages. Please note that this is an approximate number as Facebook does not provide 100% accurate numbers, even though these can be considered very close to the actual number of users being redirected to the specific Market Page.